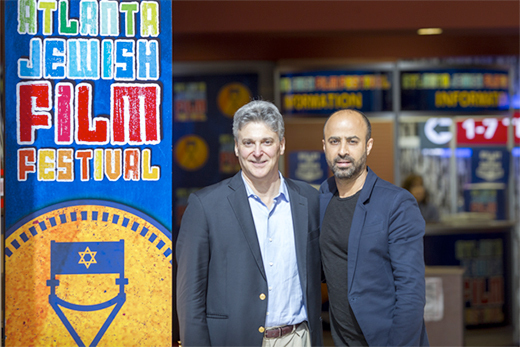 Matthew Bernstein (left), chair of Emory's film and media studies department, met Israeli filmmaker Nitzan Gilady at the Atlanta Jewish Film Festival. Now Gilady is filmmaker in residence at Emory for the semester, and the university is hosting a film series featuring his work, kicking off March 15 with "Wedding Doll." Photo by David Selby, courtesy of Atlanta Jewish Film Festival. Nitzan Gilady marked his feature film debut in 2015, and opened the door to his current role as filmmaker in residence at Emory College’s Department of Film and Media Studies this semester. And, for the next two months, Emory Cinematheque will screen five of Gilady’s films, with the director on hand to introduce his work and answer questions after each showing. “I am a big believer of learning through both observation and practice,” says Gilady, who has 18 years of experience as a senior lecturer at Israel’s Holon Institute of Technology. “I am interested in giving a voice to those who are silent and those who we don't hear, to expose the unknown, discover hidden affairs and let the camera face the people we don't normally see,” he adds. Matthew Bernstein, chair of Emory's film and media studies department, saw the movie at the 2016 Atlanta Jewish Film Festival. The department had just completed a residency with Israeli filmmaker Eran Riklis in 2015, during which Emory students collaborated with Riklis to shoot a short film, when the Israeli Institute of International Education approached him about hosting Gilady. Gilady initially wanted to become an actor and trained at New York’s Circle in the Square Theatre. His move to directing documentaries garnered attention for tackling complex social topics. His residency exposes Emory students to a passionate advocate of untold stories. Students in his course, “Designing the Reality in Israeli Documentary Film,” examine Israeli films and must also create a short documentary as their final project. “My goal is to take them through the same experience I went through when I made my first film. I am trying to sharpen the way they look at reality, turning their eyes into a camera lens,” Gilady says. He also advises young filmmakers to indulge their nascent creative impulses and embrace the freedom that an educational setting provides. ﻿“This is the time to take risks, to explore, and more than anything, to remember to enjoy the process of creation,” Gilady says. Emory students and the Atlanta community can immerse themselves in Gilady’s award-winning work during the Emory Cinematheque weekly film series starting March 15. The screenings begin at 7:30 p.m. on Wednesdays. All screenings are in White Hall room 205, with the exception of “Wedding Doll,” which will be screened in White Hall room 208.